Transform your looks from ordinary to stunning with thick, long, luxurious eyelash extensions from 40 Lashes. Eyelash extension are like having perfectly applied mascara, 24 hours a day, without the mess, dumping and hassle. What used to be the best kept beauty secret of the rich and famous is now the hottest trend for beauty-conscious women just like you. Lash extensions are a fun, safe and fantastic-looking beauty procedure that can really make a striking difference in how you look - and how others look at you! Located in the heart of downtown Fullerton, 40 Lashes specializes in giving your eyes the look you want. We can combine lashes of different length, thickness and curl in hundreds of combinations, so your extensions will be customized to accentuate your face, features and flair! Why choose 40 Lashes? Most of our customers choose us for the things we don't do. No facials, no waxing, no lash perming or tinting. We don't do nails then touch your eyes. Our technicians don't cut hair all week then squeeze in a lash job on Saturday. We are truly devoted to being the finest lash extension studio, and that specialization means outstanding results. Our lash technicians are licensed cosmetologists or estheticians who have trained to meet the demanding standards of our founder. Most eyelash extension "experts" are usual independent, and too often unlicensed and untrained. If they work at a salon, they probably rent a booth, meaning the salon owner has no say over the quality of their work. Buyer beware. 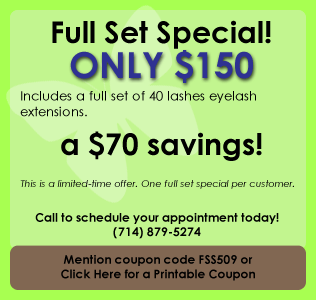 With 40 Lashes, you know you'll get a consistently excellent eyelash extension service. Give us a call today to see what a difference 40 Lashes can make in your look--and your life!